The pipe is the most basic method of distribution of fluids. It is commonly used to provide water to boilers and steam to steam engines for power generation, and later on, crude oil and oil products. Unlike transport belts, players and enemies can't walk over them. Only one fluid can be inside a pipe at one time, and the flow rate in pipes is heavily dependent on differences of fluid levels in individual segments. More complete information on handling fluids can be found on the fluid system page. Attempting to add a pipe that would potentially mix two liquids will fail, as the pipe won't be placed. Increased stack size from 50 to 100. 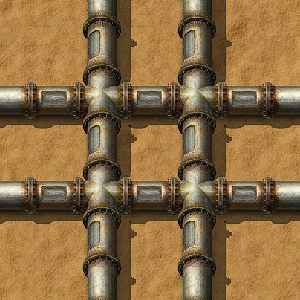 Underground pipes and belts are placed at max connecting distance apart when built by dragging. The Oil refinery and chemical plant are disconnected from pipes if the recipe is reset. Unused pipe connections are passive and do not connect to pipes. Pipes now refresh their connection to storage tanks when rotated. Small quantities of fluid can be pushed/destroyed by larger quantities in pipes. All terminating pipes now have visuals. Pipes now show fluid inside when ALT mode is enabled. The boiler is now fast-replaceable with pipes, and vice versa. Visualization of connection to a pipe to ground.